Un capuchon ju lui donnerais. Bien d’autres chos’ je lui donnerais. Oh, if my monk would dance with me! A hooded coat I will give to thee. Together let us dance today. A shining belt I will give to thee. A rosary I will give to thee. A homespun coat I will give to thee. A fine songbook I will give to thee. A ring of gold I will give to thee. Another song thought to have been sung by the voyageurs, and well-known in Quebec. 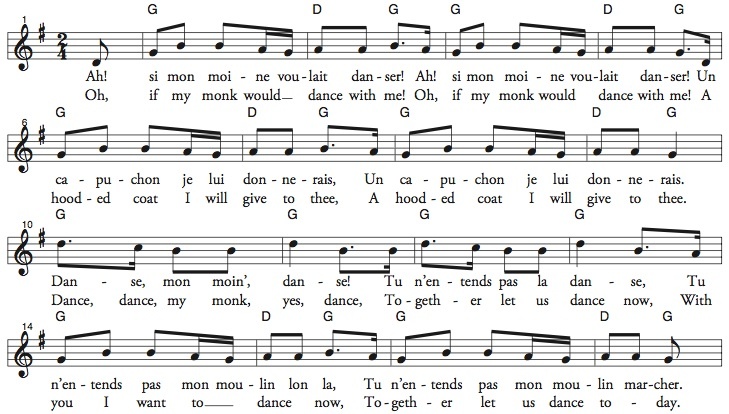 In standard French, “moine” means “monk,” but in Quebec, it also means a spinning top, so this is also a children’s game song. The song dates back to at least 1865. The French text is from Edith Fowke and Richard Johnston, Folk Songs of Quebec (Chansons de Québec), 1957. pp. 80-81. Their “translation” is really a rewrite of the song and has not been followed.